Three years ago, Julia Fierro launched her debut novel, Cutting Teeth to a packed audiance at the now closed BookCourt. 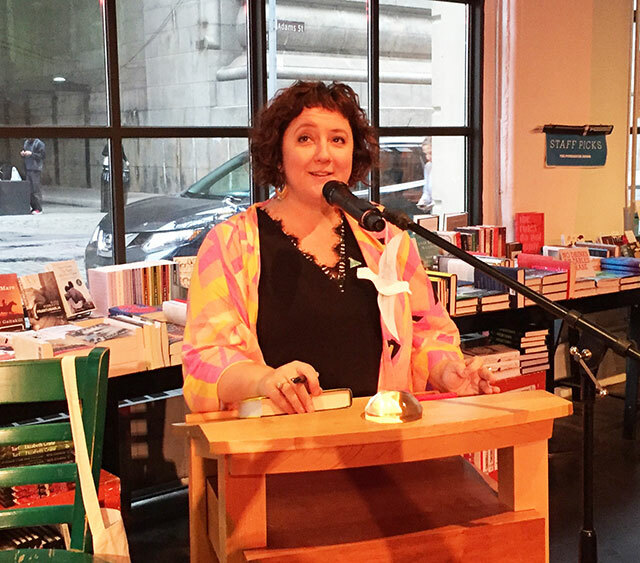 Last Tuesday, she filled the new Powerhouse bookstore for the launch of her second novel, The Gypsy Moth Summer. “It’s been hard for me to find strength in myself,” Fierro says of the long process to her first book. She explains that writing feels safe for her because she is inside other people’s heads and looking through other people’s eyes. When Fierro first moved to Brooklyn, she had just graduated with an MFA degree and hoped to sell a novel. Her rejections piled up, and for a time she gave up on writing choosing to instead focus on teaching. She launched the Sackett Street Writers Workshop from her kitchen fourteen years ago, and through teaching, earned back the confidence to write her debut Cutting Teeth. Since then, she continued expanding the program while writing The Gypsy Moth Summer. Fierro says that she is a binge writer. For the The Gypsy Moth Summer, she has spent many years thinking about the book, and so when it came to writing it down, it gushed out. At one point she locked herself in a hotel room for a total immersion experience. Part of the novel is based on her grandfather, and she wrote that original sketch as a freshman in college. The story proved a pivotal moment for her; After writing that first story, she told her parents she intended to major in English rather than continuing as a pre-law student. She says she never felt like she fit in with the other pre-law students. She spent a lot of time rewriting the first chapter. She wrote it from the perspective of dozens of characters. At one point she even wrote the chapter from the caterpillar’s perspective. In a way, that rewriting was all just procrastination. For a while, Fierro actually thought she was never going to be a writer. She enjoyed teaching at the Sackett Street Workshops and believed that was the direction her life would take. But then she came back to the novel. “You don’t really know when something is done,” she says. While there are elements in The Gypsy Moth Summer that find inspiration in Fierro’s own life, she is quick to point out the novel is fiction. Writing nonfiction is terrifying. She once read a nonfiction piece at a reading series and she says she immediately felt it was a mistake. “I feel more vulnerable when I’m writing nonfiction,” she says. Nevertheless, to support the novel, she wrote a nonfiction piece in the New York Times about her success with antidepressants. She once took a psychology class but knew she would never be therapist because she knows no personal boundaries. Despite teaching workshops for years, Fierro has never really read much about craft. What she has learned comes from reading. Her focus is really about looking at how a character sees the world and that defines every element of the story.